Web administrators will find that there are many ways to manage Web and application servers. The key administration tools and techniques are covered in the following sections. 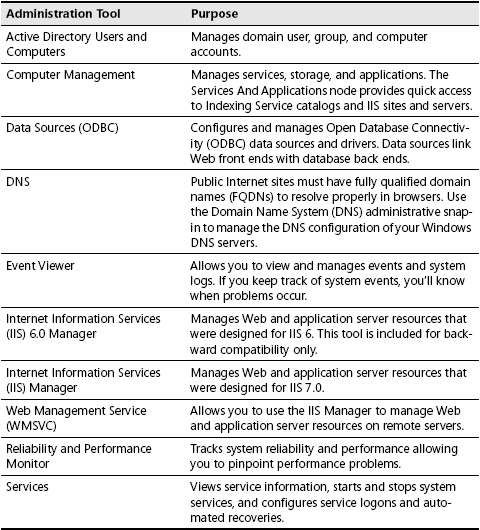 Many tools are available for managing Web resources. Key tools you’ll use are shown in Table 1-2. Most of these tools are available on the Administrative Tools menu. Click Start and choose All Programs, Administrative Tools, and then the tool you want to use. You can use all the tools listed in the table to manage local and remote resources. 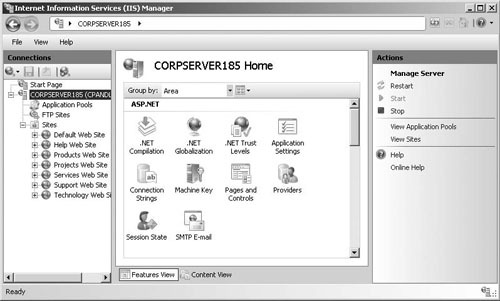 For example, if you connect to a new computer in IIS Manager, you can manage all its sites and services remotely from your system. When you add services to a server, the tools needed to manage those services are automatically installed. If you want to manage these servers remotely, you might not have these tools installed on your workstation. In that case, you need to install the administration tools on the workstation you’re using. In Internet Information Services (IIS) Manager, click Start Page in the console tree and then click Connect To A Server. This starts the Connect To A Server wizard. Type or select the server name in the Server Name box. For a server on the Inter-net, type the FQDN of the server, such as www.adatum.com. For a server on the local network, type the computer name, such as WEBSVR87. Port 80 is the default port for connections. As necessary, you can provide the port to which you want to connect. For example, if you want to connect to the server on port 8080, you would follow the server name by :8080, such as WEBSVR87:8080. After you type the server name (and optionally the port number), click Next. IIS Manager will then try to use your current user credentials to log on to the server. If this fails, you’ll need to provide the appropriate credentials on the presented Provide Credentials page before clicking Next to continue. Click Finish to complete the connection. Tip If IIS Manager displays a connection error stating that the remote server is not accepting connections, you’ll need to log on locally or through remote desktop. Once logged on, check to ensure the Management Service is started and configured properly. For more information, see the “Enabling and Configuring Remote Administration” section of Chapter 3. In Internet Information Services (IIS) Manager, click Start Page in the console tree and then click Connect To A Site. This starts the Connect To A Site Wizard. Type or select the server name in the Server Name box, such as TESTSVR22. In the Site Name box, type or select the name of the Web site to which you want to connect, such as Default Web Site. Click Next. IIS Manager will then try to use your current user credentials to log on to the server. If this fails, you’ll need to provide the appropriate credentials on the presented Provide Credentials page before clicking Next to continue. Click Finish to complete the connection. In Internet Information Services (IIS) Manager, click Start Page in the console tree and then click Connect To An Application. This starts the Connect To An Application Wizard. In the Application Name box, type or select the relative path of the Web application to which you want to connect, such as /MyApplication or /Apps/Myapp. As Figure 1-2 shows, IIS Manager has been completely redesigned for IIS 7.0. Instead of being a snap-in for the Microsoft Management Console, IIS Manager is now a stand-alone application with a browser-like interface. 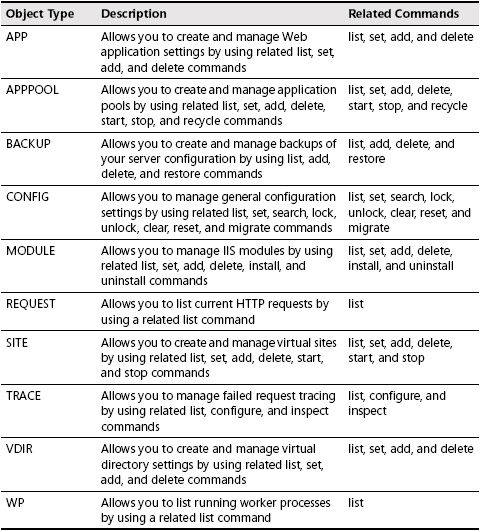 Once you connect to a server, site, or application, IIS Manager automatically connects to these installations upon startup. You can change this behavior by disconnecting from the remote server while in IIS Manager. See Chapter 3 for more information on using IIS Manager. 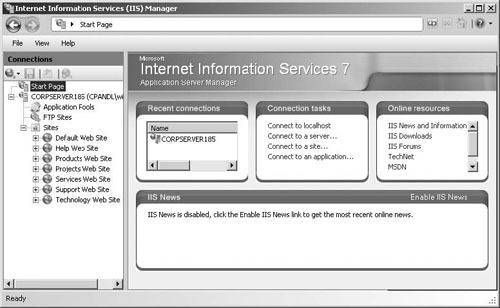 Figure 1-2 IIS Manager has a completely redesigned interface in IIS 7.0. Note You use Path to temporarily update the command path for the current window. You use SETX PATH to permanently update the command path for future command windows. Table 1-3 provides a summary of the core set of administration objects for the IIS command-line administration tool. ADD Creates a new object with the properties you specify. DELETE Deletes the object you specify. LIST Displays a list of related objects. Optionally, you can specify a unique object to list, or you can type one or more parameters to match against object properties. SET Sets parameters on the object specified. You’ll find a comprehensive discussion of using the IIS command-line administration tool in Chapter 4, “Managing IIS 7.0 from the Command Line.” In addition, you will see examples of using this tool throughout the book.